Imperceptible font colour on UI when system colour is dark. I'm running Linux Mint with Cinnamon desktop and a dark theme. Opera is adopting the system font colour on it's UI but not adopting the window UI colour, which makes the text almost impossible to perceive. 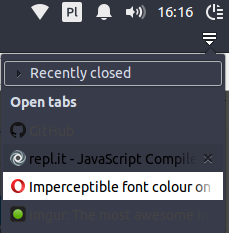 If Opera does not adopt the window color of the system, it should also not adopt the font color. Note: I'm aware a dark theme is coming, but if it offers a light theme, the theme should force appropriate font colours. Just download and check, if something wrong report it before beta / stable. That should hopefully change in version 45.